Join us in the Ledford Center and the drive beside the Ledford Gym for our first ever SEBTS Serves. 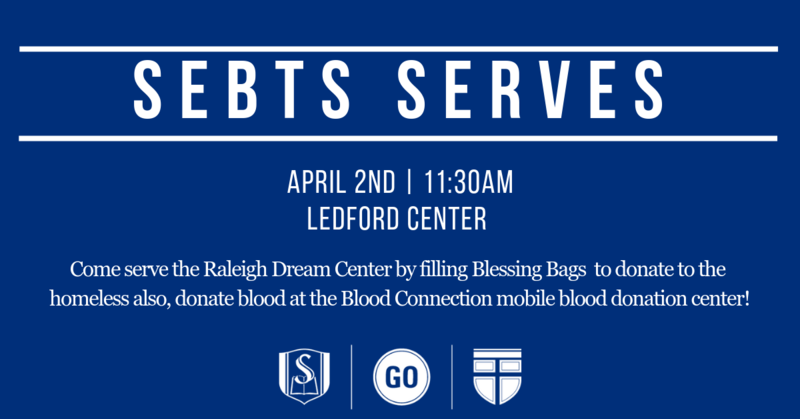 We are so excited to be able to host both the Raleigh Dream Center to fill Blessing Bags for the homeless and the Blood Connection for a blood drive! We need volunteers to fill the Blessing Bags and a smaller group to register to disperse the bags we made on April 13th. To register please visit: https://app.etapestry.com/onlineforms/RaleighDreamCenter/Adopt-a-Block.html and choose the “Moore Square” location!